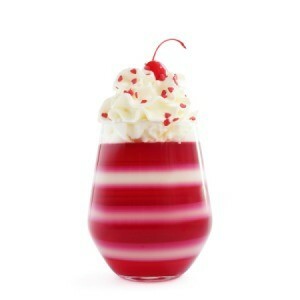 Cherry Jello has been a favorite for many years. Make this gelatin salad for your next potluck or get-together. This is a guide about cherry gelatin supreme. Love the cherry pie filling and pineapple in this recipe. Dissolve raspberry gelatin in 1 cup boiling water. Stir in pie filling, and turn into 9x9 inch baking dish. Chill until partially set. Dissolve lemon gelatin in 1 cup boiling water. Beat together cream cheese and mayonnaise. Gradually add lemon gelatin. Stir in undrained pineapple. Whip 1/2 cup whipping cream, and fold into lemon mixture with 1 cup tiny marshmallows. Spread atop cherry layer, and top with 2 tablespoons chopped nuts. Chill until set. In a large saucepan, bring 1 cup water to a boil. Stir in cherry gelatin until dissolved. Add pie filling; mix well. Pour into an 11x7 inch dish. Cover and refrigerate for 2 hours or until set. In a saucepan, bring remaining water to a boil. Stir in lemon gelatin until dissolved. In a small mixing bowl, beat the cream cheese and mayonnaise until smooth. Beat in lemon gelatin and pineapple. Cover and refrigerate 45 minutes. Fold in the marshmallows and whipped cream. Spoon over cherry layer; sprinkle with pecans. Cover and refrigerate for 2 hours or until set.